The term "keyword dance," was coined by the ASO community and popularized by Daniel Peris, in order to refer to the dizzying and rapid change of keyword ranks for apps in Google Play; yet unlike real dances, the Google Play keyword dance feels decidedly less choreographed and less entertaining. Unfortunately, understanding what drives the Google Play keyword algorithm is generally harder than obtaining than the same understanding of the App Store keyword algorithm. This is due to Google’s famous algorithm changes, which make the practice of keyword optimization in the Google Play Store frustrating. To combat this challenge, here are some current tenet-level findings that can help you in your Google Play keyword optimization strategy, as well as tips listed later on. While some keywords such as [app], [game], [iPhone], [free], the app's primary/secondary categories, or partial phrases are not required to be fully present in an app's metadata for the app to be eligible for ranking, these are in the minority of cases. Eligibility/relevance in Apple's keyword algorithm is by and large based on the presence and permutations of individual words in an app's title/subtitle/keywords field/In-App Purchase name/developer name. Google's algorithm factors many more inputs when deciding which apps rank for a keyword, and where. For example, words or phrases do not always need to be present (in full or partially) in an app's Google Play listing in order to rank for a keyword search, and words from places such as use reviews can influence an app's rank. Generally, keyword ranks fluctuate much more in the Play Store than the App Store. Even for large, established apps, keyword shifts may occur on highly relevant keywords. Incipia's hypothesis is that Google's algorithm is constantly working to assess the relevance of every app in any given period of time for a given keyword. To maintain this assessment strong, Google needs a constant stream of fresh data, and requires data for multiple apps at multiple positions. If Google were to leave each app at each position for extended periods of time, as Apple often does, then the ranking algorithm would have a more outdated understanding of which apps are the best fit for each keyword at any one point in time. Even controlling for performance per position is an estimate and no substitute for real data. This effort at Google began before the Play Store with Google’s pagerank algorithm, which used the wisdom of the masses to decide relevance, and led Google to gradually reduce the influence of web page metadata on SEO ranking strength. Given these differences from the App Store, the most important factor in Google Play keyword optimization is actually not keyword relevance determined via metadata, but rather an app’s organic conversion rate vs the median benchmark of peer apps on a keyword, within a specific country. 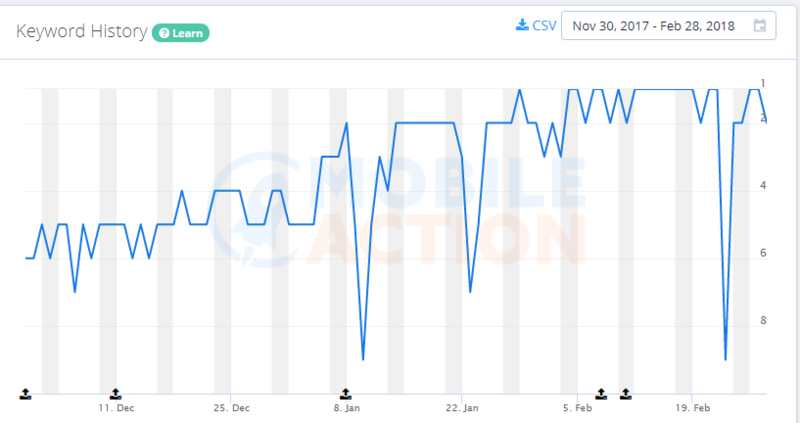 An app’s conversion rate vs the benchmark (median, 50th percentile) is a data point that Google provides, and one which has proven to be a very apt predictor of an app’s ability to gain rank on most keywords. This data point is important because it proves (and thus predicts) an app’s relative ability vs other apps to satisfy a user’s wants/needs, and thus reflects the quality of the Play Store at solving users’ wants/needs. If an app isn’t able to convert user interest (store listing visitors) into action (downloads), then there is less incentive for Google to show this app, because users will only scroll so many spots before giving up, and therefore the best apps must be shown in the top spots in order to keep users satisfied and coming back for more. An app’s conversion rate data point is also very important in iOS ASO, but secondary to download volume, based on empirical data from our work. That said, for larger apps with an established brand/awareness, it is noticeably easier to rank highly on keywords than smaller apps, in both the App Store and Play Store. Downloads are secondary because apps can simply pay for (game) downloads, which does not always mean that organic users will value the app (think incentivized ads). Other data points, including retention rate, star rating, ratings/reviews volume, and app stability are also factors, but their impact is less considered to be a primary influence than download volume and conversion rate. Because of Google’s heavy reliance on relative conversion rate, there no "silver bullet" keyword trick that can consistently boost your rank from 10 to 5, especially for head terms and competitive keywords. Density, while an interesting concept and the most often considered to be a silver bullet option, is not. While we have found a correlation with having a certain level of density, there is also a point of diminishing return (and in some cases even an over-dense penalty point) that prevents density from being a silver bullet to earning top keyword ranks. If your conversion rate vs the benchmark is negative, then set to work immediately running experiments to raise this number. As covered above, without having a good conversion rate, capturing good keyword ranks will be an uphill battle. The easiest place to start is by optimizing for keywords not currently present in your metadata. This exercise is often effective at capturing low hanging fruit gains with minimal effort. After adding a keyword, track the rank on this keyword for 7-21 days and see whether your resting range is better than before optimization. The keywords which post positive progress over weeks are the best to target in your metadata keyword mix. Measure your real store listing visitors and installs throughout keyword optimization to see whether your optimizations are moving the needle. Earning better keyword ranks is good, but only if they result in an increase in download volume! Per point #3 in the three differences between iOS and Android keyword optimization listed above, leave keywords that rank well alone (unless they worsen in rank) to avoid inadvertently doing damage to your top keyword ranks. But know that ranks beyond 10 or 20 are not considered top ranks. During the process of keyword optimization in Google Play, be aware that sometimes keywords may take weeks or even months for Google to gather enough data to be satisfied and allow a keyword to end up at a resting range (recall that keywords in Google Play fluctuate constantly for hypothesized freshness of data, giving the meaning to this phrase, “resting range”). Additionally, keywords may also experience wildly negative fluctuations in rank, only to see a good final resting range. 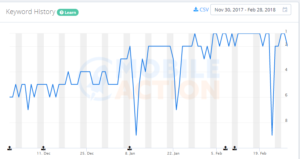 Thankfully, Google has set in motion plans to release organic keyword level store listing visitor/installs/conversion rate/ARPU/retention rate to ASO marketers. This data promises to be some of the most eye-opening revealed to the ASO community yet, shedding light on keyword-level performance, which along with keyword ranks will allow much more accurate keyword optimization and broader correlation analysis of ASO ranking factors. Stay tuned to the Incipia blog for more on keyword optimizations and other ASO best practices!